Columbus, OH – The Dominican Sisters of Peace sponsor primary and secondary schools in Ohio, New York, Louisiana, and Tennessee. It is our goal at each of these schools to provide not just an outstanding education, but a solid grounding in our Catholic faith and in the four pillars of our Dominican life: prayer, study, community, and service. Following the tragic shooting at Marjory Stoneman Douglas High, our Congregation responded to support the efforts of student activists by encouraging our own schools to honor the lives lost and to encourage Congress to enact laws to ensure gun safety. The Social Justice team created a guide to help schools plan and publicize events at each location. The Congregation also shared this guide with other Dominican congregations across the country. Our Dominican Academy was one more than 440 Heads of School in the New York City metropolitan area and across New York State to sign an open letter to national lawmakers asking for legislation to curb gun violence. This letter was published as a full page ad in the New York Times on Sunday, February 25, 2018. Students at Our Lady of the Elms, Akron, OH, read the names of those lost to gun violence at Marjory Stoneman Douglas High School. 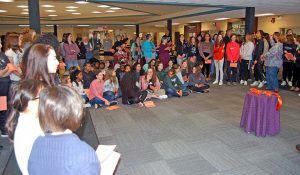 On March 14, students and staff at Our Lady of the Elms Middle School and Upper School in Akron, OH, gathered to pray for the 17 students and staff who lost their lives at Marjory Stoneman Douglas High School, and to advocate for non-violence and sensible gun control legislation in the United States. Some of the Dominican Sisters of Peace and Associates in the Akron area joined the school for this prayer. The prayer service included the reading of the 2013 Dominican Sisters of Peace corporate stance regarding sensible gun control, songs, prayers and petitions. As the names of the 17 students and faculty who lost their lives were read, 17 representatives tied orange ribbons on two trees in the school courtyard. After the school hymn was sung, all participants were invited to take an orange ribbon to wear during the day. Students at St. Mary’s High School in New Orleans, LA, hold a candlelight procession to honor the students and staff lost to gun violence at Marjory Stoneman Douglas High School. 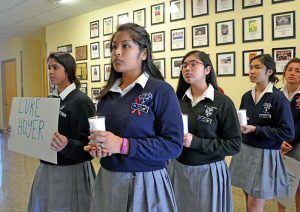 Students at St. Mary’s Dominican High School in New Orleans, LA, gathered for 17 minutes of prayer and remembrance of the 17 lives lost February 14th at Marjory Stoneman Douglas High School in Parkland, Florida. Student preachers led the assembly that opened with the procession of students carrying lighted candles, paired with 17 students who carried hand-made signs bearing the names of those who died in Parkland. The Hail Mary was recited after each name was read. Students who carried signs stood on the stage facing the assembly. Student preachers shared reflections and closed with Our Family Prayer, the Archdiocese’s prayer against violence, murder and racism. As the Dominican Bell rang 17 times, students dispersed in silence. 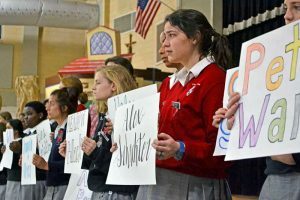 Students at St. Mary’s High School in New Orleans, LA, held signs with the names of 17 students and staff murdered at Marjory Stoneman Douglas High School during a memorial prayer service. The Dominican Sisters of Peace have also prepared a guide for all Motherhouses and ministries to take part in the March 24 March for our Lives. It is expected that the majority of the Congregation’s Sisters and Associates will take part in the march nearest to their location.